Boutique Marquees provide seriously stylish, luxurious white cotton canvas Petal Pole and Sailcloth marquees for all events across the UK. 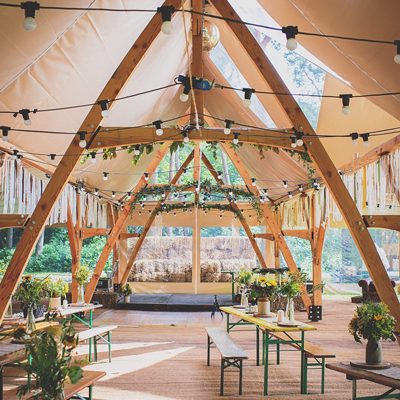 A marquee wedding allows your creativity to flourish as you bring your very own, unique venue to life. Boutique Marquees are with you every step of the way on your journey to create memories that will last a lifetime. From practical advice to styling ideas, they have a wealth of events experience and work with some of the best in the industry to bring your vision to life. 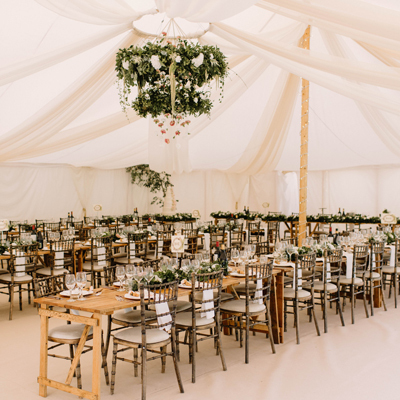 As well as high quality marquees, they also offer a range of carefully curated furniture and props to help you create your vision and that all important wow factor. Thank you Boutique Marquees for providing the most beautiful petal marquee for our son and daughter in law's wedding last weekend. It was stunning. The service you have provided has been second to none from the start to the final packing away. Andy and the crew were a delight to work with in the erection and packing away of the tent. Andy went the extra mile when one of the tables wasn't exactly what we thought it would be and replaced it the following day with a more suitable one. I cannot recommend this company highly enough. Good value for money, excellent customer service and an absolute pleasure to work with. Thank you. First class experience from initial enquiry to the team taking the marquee down after the event. Absolute pleasure to deal with Clare and her team and the marquee was beautiful, everyone commented on how lovely it was and was perfect for what we needed it for; first day a ruby anniversary lunch and the second day a christening party. So pleased we found Boutique Marquees, thanks for everything. Clare & her team were a pleasure to work with. As a wedding planner it's always such a reassurance to work with a professional friendly small company who know what they are doing. My ten million questions were always answered and the marquee was in beautiful condition. I will definitely be using Clare again for any future marquee events and would highly recommend Boutique Marquees to any of my clients or friends/family. Thank you so much for all your help! Boutique Marquee's were simply fantastic in the run up to our wedding and on the day itself. The marquee was absolutely stunning and was of outstanding quality. It really made our garden party themed wedding and stood out from other 'standard' marquee's on offer. We can't recommend Boutique Marquee's highly enough and would happily chat in further detail about the wonderful service they provided. Thanks so much all! I can’t recommend Boutique Marquees highly enough. We hired a sailcloth marquee and it could not have been better. The canvas and wood are beautiful quality, and really traditional, and the ability to roll the walls all the way up if the weather is nice makes them perfect for a summer party. They are flooded with light and you really feel as though you are outside. From the outside they look incredible, especially when all lit up after dark. Clare and Andy were great to deal with, and they really went the extra mile to make sure everything was perfect.